Nielsen and Culturati announced today the launch of the Nielsen-Culturati Hispanic Segmentation. This new collaboration combines the power of Nielsen’s Homescan Panel data with the depth of understanding of Culturati’s attitudes and values-based U.S. Hispanic segmentation model. With this launch, more about the breadth of Hispanic consumer measurement is extended beyond just language and demographics to incorporate important factors such as attitudes and values. Culturati’s segmentation model uncovers the motivation behind shopper and consumer behavior. With this model, order marketers will be able to maximize their Hispanic marketing investments by developing the right marketing plans, more about in-store programs and communications strategies. This calibrated approach more clearly defines the bicultural opportunity and delivers a deeper understanding of the total U.S. Hispanic Landscape. For marketers, this means that they can now track brand results by bicultural and other key Hispanic segments and identify key growth opportunities. Therefore, bicultural consumers are a crucial group to understand. The Hispanic-bicultural sub-group accounts for 44% of U.S. Hispanic population and represents 45% of total U.S. Hispanic buying power. •Latinistas (culturally Hispanic) are very traditional and Hispanic centered, as well as the least focused on blending cultures. One third of Latinistas are 2nd or 3rd generation and more than half prefer to speak Spanish, but can use English if needed. •Heritage Keepers (bicultural), while somewhat progressive, they are Hispanic centered and focused on preserving their heritage. Most (86%) Heritage Keepers are 1st generation Hispanics and prefer to speak in Spanish. •Savvy Blenders (bicultural) are very progressive, embrace diversity, and are focused both on preserving their heritage and blending cultures. Savvy Blenders are bilingual and their language preference is highly situational. While this segment has a strong 2nd generation population, at 49%, it is quite diverse with 1st generation accounting for 29% and 3rd generation accounting for 22% of the segment. •Ameri-Fans (culturally American) are progressive with a diluted Hispanic heritage, and are closest to the average mainstream consumer. The majority (82%) is 2nd or 3rd generation and prefers to speak in English. Hispanics in the U.S. are a burgeoning group with significant buying power and an attractive objective audience for brands. They’re buying cars, moving into new homes, furnishing those homes, and spending on consumer goods. Hispanics are no longer a subset of the market: they are a significant player in their own right. Connecting with Hispanic audiences is critical for all brands if they want to grow over the next decade. 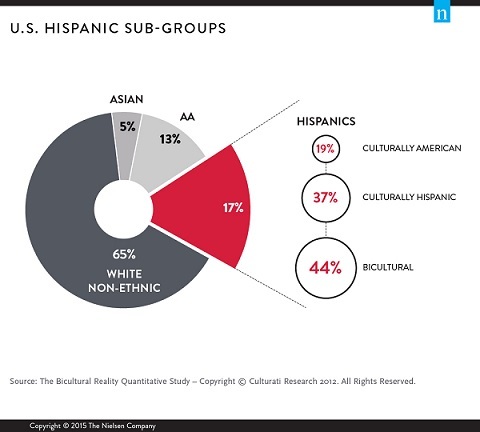 The Nielsen-Culturati Hispanic Segmentation is currently available. Contact Marissa Romero-Martin for more information about this exciting new product.